Lynn Cossey, Carnival UK’s senior manager of vetting & compliance, says, ”It’s a legal requirement to have accurate and signed contracts for all seafarers when they join a ship and for the duration of their employment. Filestream stores this centrally." 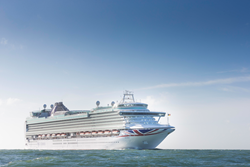 Filestream announces that Carnival UK has selected its electronic document management software (EDMS) to manage all seafarer employment agreements (SEAs) for crew working on its two famous cruise brands – Cunard Line and P & O Cruises. With 11 ships combined, this totals around 18,000 seafarers from 80 nationalities, with staff numbers expected to increase 20% when P & O launches its biggest ship ever in 2020. Carnival UK is a wholly owned subsidiary of Carnival Corporation & plc, the world’s largest cruise company carrying 48% of global cruise guests. Operating 102 ships through a portfolio of nine global, regional and national cruise brands, the company carried 11.5 million guests last year and achieved the most profitable year in its history with a net income of $2.8 billion . This is crucial given Carnival UK employs so many people. Employment contracts are complex and varied – some are annual, others are fixed term based on the specific ship and voyage – and differ due to the employing entity and nationality of the individual. Last year alone, 27,000 different documents were generated. The Filestream-based seafarer contract management system allows Carnival UK to meet the International Labour Organisation’s Maritime Labour Convention 2006 rules – now binding in international law – which sets out minimum working and living standards for all seafarers. It means that the business is also compliant when inspected by Port Authorities, Flag State Inspectors or Carnival’s own internal auditors. Filestream’s EDMS integrates with Carnival UK’s HR system called Mistral which is used to generate each SEA. This shows the date of employment, terms and conditions, salary, entitlements and so on. This is emailed to each person, signed when they join the ship and then scanned so that a ‘wet’ signature can be shown. Filestream is accessed using a standard web-browser by crew managers on board each ship – individuals who have the responsibility for checking crew documentation – as well as manning agents onshore. Filestream’s EDMS runs on Microsoft Windows Server with information stored centrally at Carnival UK’s datacentre in Southampton. The system is set up so that each ship only has access to own seafarer data.